Chicago—A brutal cold spell that paralyzed the US Midwest, freezing water mains, causing power outages and canceling flights, eased on Friday, with forecasts predicting a rapid thaw. The two days of intense cold from the so-called polar vortex that descended on the US Midwest and Northeast will go down in memory for its scenes of winter at its most bitter. Blocks of ice floated down the river that runs through downtown Chicago, the rushing waters of the Niagara Falls were frozen in some places, and half the Great Lakes were covered in ice. 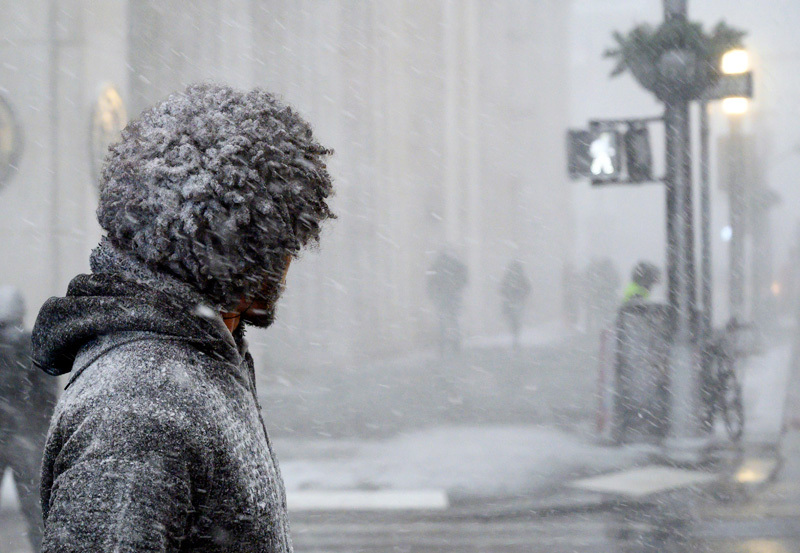 US media reported as many as 21 weather-related deaths since a snow storm hit the Midwest early in the week, followed by plunging temperatures Wednesday and Thursday. Temperature readings were nosing up on Friday and “will continue to moderate,” the National Weather Service said. The concern, though, turned to the threat of flooding and further stress on already strained infrastructure as the region thawed out. “In some areas of the Midwest, the coming wild temperature swing will be the most extreme warm-up from record winter cold ever seen in such a short time period,” Jeff Masters, meteorologist at Weather Underground, told AFP. By Monday, the weather was expected to be comparatively balmy -- around 50F (10C) in Chicago and Detroit. “It’s important to remember that the rapid change in weather and snow melt could lead to dangerous flooding,” James Joseph, the regional director of the Federal Emergency Management Agency (FEMA), said in a statement. In Illinois, state officials said they were discharging warm water from a nuclear power station into a river in order to prevent ice jams and flash flooding. Elements of normal life resumed in fits and starts, including transportation. Thousands of flights were scrapped this week, especially at Chicago’s two major airports, which experienced more than 1,500 cancellations a day. The city is a regional hub, and passengers were left stranded or looking for alternate routes. “The majority of our customers have already been rebooked,” American Airlines spokesman Ross Feinstein told AFP on Friday. Children -- some of whom have been at home for almost a week -- returned to class in many school districts, while others were off for another day because frozen school buses would not start. Milwaukee schools in Wisconsin were open, but Chicago schools were not. In Minneapolis, students were back in class but food deliveries for school lunches were disrupted. Hypothermia and frostbite proved to be major dangers this week. Officials repeatedly warned the homeless to take advantage of increased shelter capacity, and for others in need, such as the elderly, to use the hundreds of warming centers opened throughout the region. They also warned residents to not spend more than a few minutes at a time outside. Despite those efforts, there were still reports of fatalities. The University of Iowa confirmed that Gerald Belz, a pre-med student, had died Wednesday. Local media reported that the 18-year-old was found unconscious outside a university building when temperatures were in the negative double digits in Iowa City.